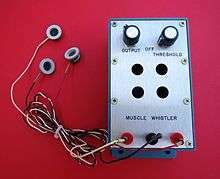 The "Muscle Whistler", shown here with surface EMG electrodes, was an early biofeedback device developed by Dr. Harry Garland and Dr. Roger Melen in 1971. HRV data from both polyplethysmographs and electrocardiograms are analyzed via mathematical transformations such as the commonly-used Fast Fourier Transform (FFT). The FFT splits the HRV data into a power spectrum, revealing the waveform's constituent frequencies. Among those constituent frequencies, high-frequency (HF) and low-frequency (LF) components are defined as above and below .15 Hz, respectively. As a rule of thumb, the LF component of HRV represents sympathetic activity, and the HF component represents parasympathetic activity,. The two main components are often represented as a LF/HF ratio and used to express sympathovagal balance. Some researchers consider a third, medium-frequency (MF) component from .08 Hz to .15 Hz, which has been shown to increase in power during times of appreciation. Christopher deCharms (of Omneuron in San Francisco) in conjunction with Stanford University School of Medicine has developed a real-time fMRI for the purpose of training the brain to activate its own endogenous opiates. Dr. deCharms believes this will revolutionize the treatment of chronic pain. 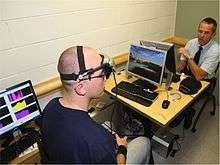 The patient can control his own pain by visually looking at his rtfMRI, watching his own reactions in real time, and then blocking the pathways causing pain. deCharms mentions that clinical trials with rtfMRI is measuring a 44 to 64 percent decrease in chronic pain. With 8 participants in the study, deCharms et al. (2005) demonstrated that subjects can control the pain of heat stimulus, by visually observing in real time their brain activity. The subjects were instructed to use techniques such as changing the focus of their attention to the pain, and changing the emotional value of the pain. Then while viewing their own fMRI in real time the subjects could observe the effect of their thoughts on the part of the brain called the rostral anterior cingulate cortex (rACC). When the subject 'controlled the pain' the virtual flame on the fMRI got dimmer. Results from this study indicate two things: 1. That subjects can learn to voluntarily control brain activity in a specific region of the brain, and 2. There is a significant increase in the ability of healthy subjects to control their pain with repeated training. This study was then repeated with 8 patients with chronic intractable pain. The results showed that these patients were successful in reducing their pain rating by 64% (using the McGill Pain Questionnaire). The authors state that this is not yet a 'treatment', but still under serious investigation. Charles Wehrenberg implemented competitive-relaxation as a gaming paradigm with the Will Ball Games circa 1973. In the first bio-mechanical versions, comparative GSR inputs monitored each player's relaxation response and moved the Will Ball across a playing field appropriately using stepper motors. In 1984, Wehrenberg programmed the Will Ball games for Apple II computers. The Will Ball game itself is described as pure competitive-relaxation; Brain Ball is a duel between one player's left- and right-brain hemispheres; Mood Ball is an obstacle-based game; Psycho Dice is a psycho-kinetic game. In 1999 The HeartMath Institute developed an educational system based on heart rhythm measurement and display on a Personal Computer (Windows/Macintosh). Their systems have been copied by many but are still unique in the way they assist people to learn about and self-manage their physiology. A handheld version of their system was released in 2006 and is completely portable, being the size of a small mobile phone and having rechargeable batteries. With this unit, one can move around and go about daily business while gaining feedback about inner psycho-physiological states. ↑ Durand, Vincent Mark; Barlow, David (2009). Abnormal psychology: an integrative approach. Belmont, CA: Wadsworth Cengage Learning. pp. 331. ISBN 0-495-09556-7. 1 2 3 4 "What is Biofeedback". (See bottom of page.). Association for Applied Psychophysiology and Biofeedback. 18 May 2008. Retrieved 2015-03-05. ↑ deCharms RC, Maeda F, Glover GH, et al. (December 2005). "Control over brain activation and pain learned by using real-time functional MRI". Proceedings of the National Academy of Sciences of the United States of America. 102 (51): 18626–31. Bibcode:2005PNAS..10218626D. doi:10.1073/pnas.0505210102. PMC 1311906 . PMID 16352728. ↑ Nestoriuc Y, Martin A (March 2007). "Efficacy of biofeedback for migraine: a meta-analysis". Pain. 128 (1–2): 111–27. doi:10.1016/j.pain.2006.09.007. PMID 17084028. ↑ Nestoriuc Y, Martin A, Rief W, Andrasik F (September 2008). "Biofeedback treatment for headache disorders: a comprehensive efficacy review". Appl Psychophysiol Biofeedback. 33 (3): 125–40. doi:10.1007/s10484-008-9060-3. PMID 18726688. 1 2 Brown, Barbara B (January 1, 1975). New mind, new body: Bio-feedback; new directions for the mind. ASIN B0006W86JE. ↑ Karlins, Marvins (January 1, 1973). Biofeedback. ISBN 978-0446760188. ↑ Durand, Vincent Mark; Barlow, David (2009). Abnormal psychology: an integrative approach. Belmont, CA: Wadsworth Cengage Learning. p. 331. ISBN 0-495-09556-7. ↑ Brown, Barbara B (1975). "Biological Awareness as a State of Consciousness". Journal of Altered States of Consciousness. 2 (1-14). ↑ Dupuis, Garnet (November 29, 2001). "The Unconscious and Its Role in Biofeedback Processes". Center of International Studies. ↑ Leslie H. Sherlinab; Martijn Arns; Joel Lubar; Hartmut Heinrich; Cynthia Kerson; Ute Streh & M. Barry Sterman (2011). "Neurofeedback and Basic Learning Theory: Implications for Research and Practice". Journal of Neurotherapy. 15 (4). ↑ Skinner, B.F. (1974). About Behaviorism. ISBN 0-394-71618-3. ↑ Bateson, Gregory (1972). Form, Substance, and Difference, in Steps to an Ecology of Mind. University of Chicago Press. ↑ Claude, Shannon (1949). The Mathematical Theory of Communication. ↑ Garland, Harry; Melen, Roger (1971). "Build the Muscle Whistler". Popular Electronics. 35 (5): 60–62. 1 2 Forward, Edna (April 1972). "Patient Evaluation with an Audio Electromyogram Monitor: "The Muscle Whistler"". Physical Therapy. 52 (4): 402–403. ↑ Tassinary, L. G., Cacioppo, J. T., & Vanman, E. J. (2007). The skeletomotor system: Surface electromyography. In J. T. Cacioppo, L. G. Tassinary, & G. G. Berntson, (Eds.). Handbook of psychophysiology (3rd ed.). New York: Cambridge University Press. ↑ Florimond, V. (2009). Basics of surface electromyography applied to physical rehabilitation and biomechanics. Montreal: Thought Technology Ltd.
↑ "Electromyography (EMG)". Johns Hopkins Medicine. Retrieved 2014-03-18. ↑ Peper, E; Gibney KH (2006). Muscle biofeedback at the computer: A manual to prevent repetitive strain injury (RSI) by taking the guesswork out of assessment, monitoring, and training (PDF). Amersfoort, The Netherlands: BFE. Archived from the original (PDF) on 2010-10-19. 1 2 3 4 5 6 7 8 9 10 11 12 13 Yucha, C; Montgomery D (2008). Evidence-based practice in biofeedback and neurofeedback (PDF). Wheat Ridge, CO: AAPB. Archived from the original (PDF) on 2010-10-09. 1 2 Andreassi, J. L. (2007). Psychophysiology: Human behavior and physiological response (5th ed.). Hillsdale, NJ: Lawrence Erlbaum and Associates, Inc.
↑ Cohen R. A.; Coffman J. D. (1981). "Beta-adrenergic vasodilator mechanism in the finger". Circulation Research. 49: 1196–1201. doi:10.1161/01.res.49.5.1196. ↑ Freedman R. R.; Sabharwal S. C.; Ianni P.; Desai N.; Wenig P.; Mayes M. (1988). "Nonneural beta-adrenergic vasodilating mechanism in temperature biofeedback". Psychosomatic Medicine. 50 (4): 394–401. doi:10.1097/00006842-198807000-00007. PMID 2842815. ↑ Dawson, M. E., Schell, A. M., & Filion, D. L. (2007). The electrodermal system. In J. T. Cacioppo, L. G. Tassinary, & G. G. Berntson (Eds.). Handbook of psychophysiology (3rd ed.). New York: Cambridge University Press. ↑ Moss, D. (2003). The anxiety disorders. In D. Moss, D., A. McGrady, T. Davies, & I. Wickramasekera (Eds. ), Handbook of mind-body medicine in primary care (pp. 359-375). Thousand Oaks, CA: Sage. 1 2 Toomim M.; Toomim H. (1975). "GSR biofeedback in psychotherapy: Some clinical observations". Psychotherapy: Theory, Research, and Practice. 12 (1): 33–8. doi:10.1037/h0086402. ↑ Moss D (2005). "Psychophysiological psychotherapy: The use of biofeedback, biological monitoring, and stress management principles in psychotherapy". Psychophysiology Today. 2 (1): 14–18. ↑ Pennebaker J. W.; Chew C. H. (1985). "Behavioral inhibition and electrodermal activity during deception". Journal of Personality and Social Psychology. 49 (5): 1427–1433. doi:10.1037/0022-3514.49.5.1427. PMID 4078683. ↑ Kropotov, J. D. (2009). Quantitative EEG, event-related potentials and neurotherapy. San Diego, CA: Academic Press. 1 2 3 Thompson, M., & Thompson, L. (2003). The biofeedback book: An introduction to basic concepts in applied psychophysiology. Wheat Ridge, CO: Association for Applied Psychophysiology and Biofeedback. 1 2 Stern, R. M., Ray, W. J., & Quigley, K. S. (2001). Psychophysiological recording (2nd ed.). New York: Oxford University Press. ↑ LaVaque, T. J. (2003). Neurofeedback, Neurotherapy, and quantitative EEG. In D. Moss, A. McGrady, T. Davies, & I. Wickramasekera (Eds), Handbook of mind-body medicine for primary care (pp. 123-136). Thousand Oaks, CA: Sage. ↑ Steriade, M. (2005). Cellular substrates of brain rhythms. In E. Niedermeyer and F. Lopes da Silva (Eds.). Electroencephalography: Basic principles, clinical applications, and related fields (5th ed.). Philadelphia: Lippincott Williams & Wilkins. 1 2 Shaffer, F., & Moss, D. (2006). Biofeedback. In C. S. Yuan, E. J. Bieber, & B.A. Bauer (Ed. ), Textbook of complementary and alternative medicine (2nd ed.) (pp. 291-312). Abingdon, Oxfordshire, UK: Informa Healthcare. ↑ T. H. Budzynski, H. K. Budzynski, J. R. Evans, & A. Abarbanel (Eds.) (2009). Introduction to quantitative EEG and neurofeedback (2nd ed.). Burlington, MA: Academic Press. 1 2 3 4 Combatalade, D. (2009). Basics of heart rate variability applied to psychophysiology. Montreal, Canada: Thought Technology Ltd.
1 2 Lehrer, P. M. (2007). Biofeedback training to increase heart rate variability. In P. M. Lehrer, R. M. Woolfolk, & W. E. Sime (Eds.). Principles and practice of stress management (3rd ed.). New York: The Guilford Press. ↑ Peper E.; Harvey R.; Lin I.; Tylova H.; Moss D. (2007). "Is there more to blood volume pulse than heart rate variability, respiratory sinus arrhythmia, and cardio-respiratory synchrony?". Biofeedback. 35 (2): 54–61. ↑ Berntson, G. G., Quigley, K. S., & Lozano, D. (2007). Cardiovascular psychophysiology. In J. T. Cacioppo, L. G. Tassinary, & G. G. Berntson, (Eds.). Handbook of psychophysiology (3rd ed.). New York: Cambridge University Press. 1 2 Task Force of the European Society of Cardiology and the North American Society of Pacing and Electrophysiology (1996). "Heart rate variability: Standards of measurement, physiological interpretation, and clinical use". Circulation. 93: 1043–1065. doi:10.1161/01.cir.93.5.1043. ↑ Lehrer P. M.; Vaschillo E.; Vaschillo B.; Lu S. E.; Scardella A.; Siddique M.; et al. (2004). "Biofeedback as a treatment for asthma". Chest. 126 (2): 352–361. doi:10.1378/chest.126.2.352. PMID 15302717. ↑ Giardino N. D.; Chan L.; Borson S. (2004). "Combined heart rate variability and pulse oximetry biofeedback for chronic obstructive pulmonary disease: Preliminary findings". Applied Psychophysiology and Biofeedback. 29 (2): 121–133. doi:10.1023/B:APBI.0000026638.64386.89. PMID 15208975. ↑ Karavidas M. K.; Lehrer P. M.; Vaschillo E. G.; Vaschillo B.; Marin H.; Buyske S.; et al. (2007). "Preliminary results of an open-label study of heart rate variability biofeedback for the treatment of major depression". Applied Psychophysiology and Biofeedback. 32 (1): 19–30. doi:10.1007/s10484-006-9029-z. PMID 17333315. ↑ Trousselard, M.; Canini, F.; Claverie, D.; Cungi, C.; Putois, B.; Franck, N. (2015-09-07). "Cardiac Coherence Training to Reduce Anxiety in Remitted Schizophrenia, a Pilot Study". Applied Psychophysiology and Biofeedback. 41 (1): 61–69. doi:10.1007/s10484-015-9312-y. ISSN 1090-0586. PMC 4749648 . PMID 26346569. ↑ Hassett A. L.; Radvanski D. C.; Vaschillo E. G.; Vaschillo B.; Sigal L. H.; Karavidas M. K.; et al. (2007). "A pilot study of heart rate variability (HRV) biofeedback in patients with fibromyalgia". Applied Psychophysiology and Biofeedback. 32 (1): 1–10. doi:10.1007/s10484-006-9028-0. PMID 17219062. ↑ Cowan M. J.; Pike K. C.; Budzynski H. K. (2001). "Psychosocial nursing therapy following sudden cardiac arrest: Impact on two-year survival". Nursing Research. 50 (2): 68–76. doi:10.1097/00006199-200103000-00002. PMID 11302295. ↑ Humphreys P.; Gevirtz R. (2000). "Treatment of recurrent abdominal pain: Components analysis of four treatment protocols". Journal of Pediatric Gastroenterology and Nutrition. 31 (1): 47–51. doi:10.1097/00005176-200007000-00011. PMID 10896070. ↑ Barrios-Choplin, Bob; McCraty, Rollin; Cryer, Bruce (July 1, 1997). "An inner quality approach to reducing stress and improving physical and emotional wellbeing at work". Stress Medicine. 13: 193–201. doi:10.1002/(sici)1099-1700(199707)13:3<193::aid-smi744>3.0.co;2-i. ↑ McCraty, Rollin; Atkinson, Mike; Tiller, William A.; Rein, Glen; Watkins, Alan D. "The effects of emotions on short-term power spectrum analysis of heart rate variability". The American Journal of Cardiology. 76 (14): 1089–1093. doi:10.1016/s0002-9149(99)80309-9. 1 2 3 4 Peper, E., Tylova, H., Gibney, K. H., Harvey, R., & Combatalade, D. (2008). Biofeedback mastery: An experiential teaching and self-training manual. Wheat Ridge, CO: Association for Applied Psychophysiology and Biofeedback. ↑ Lehrer P. M.; Vaschillo E.; Vaschillo B. (2000). "Resonant frequency biofeedback training to increase cardiac variability: Rationale and manual for training". Applied Psychophysiology and Biofeedback. 25 (3): 177–191. doi:10.1023/A:1009554825745. PMID 10999236. 1 2 Fried, R. (1987). The hyperventilation syndrome: Research and clinical treatment. Baltimore: Johns Hopkins University Press. ↑ Fried, R. (1993). The psychology and physiology of breathing. New York: Plenum Press. ↑ Tokarev V.E. "A Rheoencephalogram (REG) Variability System Based on ISKRA-226 Personal Computer", Institute for Complex Problem of Hygiene Healthcare Conference, Novokuznetsk, Russia, 1989, p.115-116. ↑ Toomim, H., & Carmen, J. (2009). Homoencephalography: Photon-based blood flow neurofeedback. In T. H. Budzynski, H. K. Budzynski, J. R. Evans, & A. Abarbanel (Eds.) (2009). Introduction to quantitative EEG and neurofeedback (2nd ed.). Burlington, MA: Academic Press. ↑ Mowrer, O. H. (1960). Learning theory and behavior. New York: Wiley. ↑ Perry, J. D., & Talcott, L. B. (1989). The Kegel Perineometer: Biofeedback Twenty Years Before Its Time. A "Special Historical Paper." Proceedings of the 20th Annual Meeting of the Association for Applied Psychophysiology and Biofeedback, San Diego, CA, 169-172. ↑ Hirakawa, T; Suzuki, S; Kato, K; Gotoh, M; Yoshikawa, Y (2013-01-11). "Randomized controlled trial of pelvic floor muscle training with or without biofeedback for urinary incontinence". Int. Urogynecol. J. 24: 1347–1354. doi:10.1007/s00192-012-2012-8. PMID 23306768. ↑ Fitz, Fátima Faní; Resende, Ana Paula Magalhães; Stüpp, Liliana; Costa, Thaís Fonseca; Sartori, Marair Gracio Ferreira; Girão, Manoel João Batista Castello; Castro, Rodrigo Aquino (November 2012). "Efeito da adição do biofeedback ao treinamento dos músculos do assoalho pélvico para tratamento da incontinência urinária de esforço [Effect the adding of biofeedback to the training of the pelvic floor muscles to treatment of stress urinary incontinence]". Revista Brasileira de Ginecologia e Obstetrícia. 34 (11): vol.34 no.11 505–10. doi:10.1590/S0100-72032012001100005. PMID 23288261. ↑ Busby-Whitehead; Johnson T.; Clarke M. K. (1996). "Biofeedback for the treatment of stress and urge incontinence". The Journal of Urology. 156 (2): 483. doi:10.1016/S0022-5347(01)65896-8. 1 2 3 4 Norton, C; Cody, JD (Jul 11, 2012). "Biofeedback and/or sphincter exercises for the treatment of faecal incontinence in adults.". Cochrane Database of Systematic Reviews. 7: CD002111. doi:10.1002/14651858.CD002111.pub3. PMID 22786479. ↑ Caton R (1875). "The electric currents of the brain". British Medical Journal. 2: 278. 1 2 Brazier M. A. B. (1959). "The EEG in epilepsy: A historical note". Epilepsia. 1 (1–5): 328–336. doi:10.1111/j.1528-1157.1959.tb04270.x. ↑ Coenen A. M. L.; Zajachkivsky O.; Bilski R. (1998). "Scientific priority of A. Beck in the neuro-physiology". Experimental and Clinical Physiology and Biochemistry. 1: 105–109. ↑ Sherrington, C. S. (1906). The integrative action of the nervous system. New Haven, CT: Yale University Press. ↑ Pravdich-Neminsky V. V. (1913). "Ein versuch der registrierung der elektrischen gehirnerscheinungen". Zbl. Physiol. 27: 951–960. ↑ Forbes A.; Mann D. W. (1924). "A revolving mirror for use with the string galvanometer". J. Opt. Soc. Am. A. 8 (6): 807–816. Bibcode:1924JOSA....8..807F. doi:10.1364/JOSA.8.000807. ↑ Berger H (1920). "Ueber das elektroenkephalogramm des menschen". Archiv für Psychiatrie und Nervenkrankheiten. 87: 527–570. doi:10.1007/BF01797193. ↑ Adrian E. D.; Mathews B. H. C. (1934). "The Berger rhythm". Brain. 57 (4): 355–385. doi:10.1093/brain/57.4.355. ↑ Bremer F (1935). "Cerveau isole et physiologie du sommeil". Com. Ren. Soc. Bio. 118: 1235–1241. ↑ Bladin P. F. (2006). "W. Grey Walter, pioneer in the electroencephalogram, robotics, cybernetics, artificial intelligence". Journal of Clinical Neuroscience. 13 (2): 170–177. doi:10.1016/j.jocn.2005.04.010. PMID 16455257. ↑ Kleitman N (1960). "Patterns of dreaming". Scientific American. 203 (5): 82–88. doi:10.1038/scientificamerican1160-82. ↑ Dement, W. (2000). The promise of Sleep: A pioneer in sleep medicine explores the vital connection between health, happiness, and a good night's sleep. New York: Random House. ↑ Andersen, P., & Andersson, S. (1968). A physiological basis of the alpha rhythm. New York: Appleton-Century-Crofts. ↑ Kamiya, J. (1969). Operant control of the EEG alpha rhythm. In C. Tart (Ed. ), Altered states of consciousness. NY: Wiley. ↑ Brown, B. (1974). New mind, new body. New York: Harper & Row. ↑ Brown, B. (1977). Stress and the art of biofeedback. New York: Harper & Row. ↑ Brown, B. (1980). Supermind: The ultimate energy. New York: Harper & Row. ↑ Mulholland T.; Peper E. (1971). "Occipital alpha and accommodative vergence, pursuit tracking, and fast eye movements". Psychophysiology. 8 (5): 556–575. doi:10.1111/j.1469-8986.1971.tb00491.x. PMID 5116820. 1 2 3 Green, E., & Green, A. (1977). Beyond biofeedback. San Francisco: Delacorte Press. ↑ Sterman M. B. (1973). "Neurophysiologic and clinical studies of sensorimotor EEG biofeedback training: Some effects on epilepsy". Seminars in Psychiatry. 5: 507–524. ↑ Birbaumer N.; Elbert T.; Lutzenberger W.; Rockstroh B.; Schwarz J. (1981). "EEG and slow cortical potentials in anticipation of mental tasks with different hemispheric involvement". Biol Psychol. 13: 251–260. doi:10.1016/0301-0511(81)90040-5. PMID 7342994. ↑ Lubar, J. F. (1989). Electroencephalographic biofeedback and neurological applications. In J. V. Basmajian (Ed. ), Biofeedback: Principles and practice for clinicians (3rd ed. ), pp. 67-90. Baltimore: Williams and Wilkins. ↑ "FDA permits marketing of first brain wave test to help assess children and teens for ADHD" (Press release). Food and Drug Administration. 2013-07-15. Retrieved 2013-09-18. ↑ Feré, C., Note sur les modifications de la tension e1ectrique dans le corps human, Compt. rend. Soc. biol., 5 23. ↑ Tarchanoff J (1890). "Uber die galvanischen Erscheinungen an der Haut des Menschen bei Relzung der Sinnesorgane und bei verschiedenen Formen der psychischen Tatigkeit". Arch. Ges. Physiol. 46: 46–55. doi:10.1007/BF01789520. ↑ Peterson F.; Jung C. G. (1907). "Psycho-physical investigations with the galvanometer and pneumograph in normal and insane individuals". Brain. 30 (2): 153–218. doi:10.1093/brain/30.2.153. ↑ Meyer, Victor; Reich (June 1978). "Anxiety management--the marriage of physiological and cognitive variables". Behaviour Research & Therapy. 16 (3): 177–182. doi:10.1016/0005-7967(78)90064-5. PMID 358963. ↑ Jacobson, E. (1938). Progressive relaxation. Chicago: University of Chicago Press. ↑ Lindsley D. B. (1935). "Characteristics of single motor unit responses in human muscle during various degrees of contraction". American Journal of Physiology. 113: 88–89. ↑ Harrison V. F.; Mortenson O. A. (1962). "Identification and voluntary control of single motor unit activity in the tibialis anterior muscle". Anatomical Record. 144 (2): 109–116. doi:10.1002/ar.1091440205. PMID 13953011. ↑ Basmajian, J. V. (1967). Muscles alive: Their functions revealed by electromyography. Baltimore: Williams and Wilkins. ↑ Marinacci A. A. (1960). "Lower motor neuron disorders superimposed on the residuals of poliomyelitis. Value of the electromyogram in differential diagnosis". Bulletin of the Los Angeles Neurological Society. 25: 18. ↑ Peper, E., & Shaffer, F. (in press). Biofeedback history: An alternative view. Biofeedback. ↑ Whatmore G.; Kohli D. (1968). "Dysponesis: A neuropsychologic factor in functional disorders". Behavioral Science. 13 (2): 102–124. doi:10.1002/bs.3830130203. PMID 4231964. ↑ Whatmore, G., & Kohli, D. (1974). The physiopathology and treatment of functional disorders. New York: Grune & Stratton. ↑ Wolf S. L. (1983). "Electromyographic biofeedback applications to stroke patients. A critical review". Phys Ther. 63 (9): 1448–1459. PMID 6351119. ↑ Shumay, D. and Peper, E. (1997). Healthy computing: A comprehensive group training approach using biofeedback. In G. Salvendy, M. J. Smith, & R. J. Koubek (Eds). Design of computing systems: Cognitive considerations. New York: Elsevier. ↑ Taub E.; Uswatte G.; Pidikiti R. (1999). "Constraint-Induced Movement therapy: A new family of techniques with broad application to physical rehabilitation—A clinic review". Journal of Rehabilitation Research and Development. 36 (3): 237–251. PMID 10659807. ↑ Taub E.; Uswatte G.; King D. K.; Morris D.; Crago J.; Chatterjee A. (2006). "A placebo controlled trial of Constraint-Induced Movement therapy for upper extremity after stroke". Stroke. 37 (4): 1045–1049. doi:10.1161/01.STR.0000206463.66461.97. PMID 16514097. 1 2 Shearn D. W. (1962). "Operant conditioning of heart rate". Science. 137 (3529): 530–531. Bibcode:1962Sci...137..530S. doi:10.1126/science.137.3529.530. PMID 13911531. ↑ Engel B. T.; Chism R. A. (1967). "Operant conditioning of heart rate speeding". Psychophysiology. 3 (4): 418–426. doi:10.1111/j.1469-8986.1967.tb02728.x. PMID 6041674. ↑ E. Peper, S. Ancoli, & M. Quinn (Eds.). (1979). Mind/Body integration: Essential readings in biofeedback. New York: Plenum Press. ↑ Schwartz G. E.; Shapiro, D; Tursky, B (1971). "Learned control of cardiovascular integration in man". Psychosomatic Medicine. 33 (1): 57–62. PMID 5100734. ↑ Schultz, J. H., & Luthe, W. (1969). Autogenic therapy: Autogenic methods. New York: Grune & Stratton. ↑ Luthe, W. (1973). Autogenic therapy: Treatment with autogenic neutralization. New York: Grune & Stratton. ↑ Fahrion S.; Norris P.; Green A.; Green E.; et al. (1986). "Biobehavioral treatment of essential hypertension: A group outcome study". Biofeedback-and-Self-Regulation. 11 (4): 257–277. doi:10.1007/BF01000163. PMID 3607093. ↑ Freedman R. R.; Keegan D.; Migaly P.; Galloway M. P.; Mayes M. (1991). "Plasma catecholamines during behavioral treatments for Raynaud's Disease". Psychosomatic Medicine. 53 (4): 433–439. doi:10.1097/00006842-199107000-00008. PMID 1924655. ↑ Vaschillo E. G.; Zingerman A. M.; Konstantinov M. A.; Menitsky D. N. (1983). "Research of the resonance characteristics for the cardiovascular system". Human Physiology. 9: 257–265. ↑ Chernigovskaya N. V.; Vaschillo E. G.; Petrash V. V.; Rusanovsky V. V. (1990). "Voluntary regulation of the heart rate as a method of functioning condition correction in neurotics". Human Physiology. 16: 58–64. ↑ Lehrer P. M.; Smetankin A.; Potapova T. (2000). "Respiratory sinus arrhythmia biofeedback therapy for asthma: A report of 20 unmedicated pediatric cases using the Smetankin method". Applied Psychophysiology and Biofeedback. 25 (3): 193–200. doi:10.1023/A:1009506909815. PMID 10999237. ↑ Lehrer P.; Vaschillo E.; Lu S. E.; Eckberg D.; Vaschillo B.; Scardella A.; Habib R. (2006). "Heart rate variability biofeedback: Effects of age on heart rate variability, baroreflex gain, and asthma". Chest. 129 (2): 278–284. doi:10.1378/chest.129.2.278. PMID 16478842. ↑ Karavidas M.K. ; Lehrer P.; Vaschillo E.; Vaschillo B.; Marin H.; Buyske S.; Radvanski D.; Hassett A. (2007). "Preliminary results of an open label study of heart rate variability for the treatment of major depression". Applied Psychophysiology and Biofeedback. 32: 19–30. doi:10.1007/s10484-006-9029-z. PMID 17333315. ↑ Zucker T.L. ; Samuelson K.W. ; Muench F.; Greenberg M.A. ; Gevirtz R.N. (2009). "The effects of respiratory sinus arrhythmia biofeedback on heart rate variability and posttraumatic stress disorder symptoms: a pilot study". Appl. Psychophysiol. Biofeedback. 34: 135–143. doi:10.1007/s10484-009-9085-2. ↑ Lehrer P.M.; Gevirtz R. (2014). "Heart rate variability biofeedback: how and why does it work?". Frontiers in Psychology. 5: 756. doi:10.3389/fpsyg.2014.00756. ↑ Kudo N, Shinohara H, Kodama H (2014). "Heart rate variability biofeedback intervention for reduction of psychological stress during the early postpartum period". Applied Psychophysiology and Biofeedback. 39 (3-4): 203–11. doi:10.1007/s10484-014-9259-4. ↑ Henriques G, Keffer S, Abrahamson C, Horst SJ (2011). "Exploring the effectiveness of a computer-based heart rate variability biofeedback program in reducing anxiety in college students". Applied Psychophysiology and Biofeedback. 36 (2): 101–12. doi:10.1007/s10484-011-9151-4. 1 2 Thayer, Julian F.; Hansen, Anita L.; Saus-Rose, Evelyn; Johnsen, Bjorn Helge (8 May 2009). "Heart Rate Variability, Prefrontal Neural Function, and Cognitive Performance: The Neurovisceral Integration Perspective on Self-regulation, Adaptation, and Health". Annals of Behavioral Medicine. 37 (2): 141–153. doi:10.1007/s12160-009-9101-z. ↑ McCraty, Rollin; Atkinson, Mike; Tomasino, Dana; Bradley, Raymond (2009). "The Coherent Heart". Integral Review. 5 (2): 41–46. ↑ McCraty, Rollin; Atkinson, Mike; Tomasino, Dana; Bradley, Raymond (2009). "The Coherent Heart". Integral Review. 5 (2): 22–26. ↑ BARRIOS-CHOPLIN, BOB; McCRATY, ROLLIN; CRYER, BRUCE (July 1997). "AN INNER QUALITY APPROACH TO REDUCING STRESS AND IMPROVING PHYSICAL AND EMOTIONAL WELLBEING AT WORK". Stress Medicine. 13 (3): 193–201. doi:10.1002/(SICI)1099-1700(199707)13:3<193::AID-SMI744>3.0.CO;2-I. ↑ Lown, B; DeSilva, RA (22 May 1978). "Roles of psychologic stress and autonomic nervous system changes in provocation of ventricular premature complexes.". The American journal of cardiology. 41 (6): 979–85. doi:10.1016/0002-9149(78)90850-0. PMID 665521. ↑ Tsuji, H.; Larson, M. G.; Venditti, F. J.; Manders, E. S.; Evans, J. C.; Feldman, C. L.; Levy, D. (1 December 1996). "Impact of Reduced Heart Rate Variability on Risk for Cardiac Events: The Framingham Heart Study". Circulation. 94 (11): 2850–2855. doi:10.1161/01.CIR.94.11.2850. ↑ Tsuji, H.; Venditti, F. J.; Manders, E. S.; Evans, J. C.; Larson, M. G.; Feldman, C. L.; Levy, D. (1 August 1994). "Reduced heart rate variability and mortality risk in an elderly cohort. The Framingham Heart Study". Circulation. 90 (2): 878–883. doi:10.1161/01.CIR.90.2.878. ↑ Kemp, Andrew H.; Quintana, Daniel S. (September 2013). "The relationship between mental and physical health: Insights from the study of heart rate variability". International Journal of Psychophysiology. 89 (3): 288–296. doi:10.1016/j.ijpsycho.2013.06.018. ↑ McCraty, Rollin; Atkinson, Mike; Tiller, William A.; Rein, Glen; Watkins, Alan D. (November 1995). "The effects of emotions on short-term power spectrum analysis of heart rate variability". The American Journal of Cardiology. 76 (14): 1089–1093. doi:10.1016/S0002-9149(99)80309-9. ↑ Mittleman, MA; Maclure, M; Sherwood, JB; Mulry, RP; Tofler, GH; Jacobs, SC; Friedman, R; Benson, H; Muller, JE (1 October 1995). "Triggering of acute myocardial infarction onset by episodes of anger. Determinants of Myocardial Infarction Onset Study Investigators.". Circulation. 92 (7): 1720–5. PMID 7671353. ↑ Tiller, William; McCraty, Rollin; Atkinson, Mike (January 1996). "Cardiac Coherence: A New, Noninvasive Measure of Autonomic Nervous System Order" (PDF). Alternative Therapies. 2 (1): 52–65. Retrieved 26 April 2016. ↑ Boutcher, Stephen H.; Park, Young; Dunn, Sarah Louise; Boutcher, Yati N. (May 2013). "The relationship between cardiac autonomic function and maximal oxygen uptake response to high-intensity intermittent-exercise training". Journal of Sports Sciences. 31 (9): 1024–1029. doi:10.1080/02640414.2012.762984. ↑ Krygier, Jonathan R.; Heathers, James A.J. ; Shahrestani, Sara; Abbott, Maree; Gross, James J.; Kemp, Andrew H. (September 2013). "Mindfulness meditation, well-being, and heart rate variability: A preliminary investigation into the impact of intensive Vipassana meditation". International Journal of Psychophysiology. 89 (3): 305–313. doi:10.1016/j.ijpsycho.2013.06.017. ↑ Newton-John T. R.; Spense S. H.; Schotte D. (1994). "Cognitive-Behavioral Therapy versus EMG Biofeedback in the treatment of chronic low back pain". Behavior Research and Therapy. 33: 691–697. doi:10.1016/0005-7967(95)00008-l.
↑ Budzynski T. H.; Stoyva J. M. (1969). "An instrument for producing deep muscle relaxation by means of analog information feedback". Journal of Applied Behavior Analysis. 2 (4): 231–237. doi:10.1901/jaba.1969.2-231. PMC 1311072 . PMID 16795225. ↑ Budzynski T. H.; Stoyva J. M. (1973). "An electromyographic technique for teaching voluntary relaxation of the masseter muscle". Journal of Dental Research. 52 (1): 116–119. doi:10.1177/00220345730520010201. PMID 4509482. ↑ McNulty W. H.; Gevirtz R. N.; Hubbard D.; Berkoff G. M. (1994). "Needle electromyographic evaluation of trigger point response to a psychological stressor". Psychophysiology. 31 (3): 313–316. doi:10.1111/j.1469-8986.1994.tb02220.x. PMID 8008795. ↑ Budzynski, T. H., Stoyva, J. M., Adler, C. S., & Mullaney, D. EMG biofeedback and tension headache: A controlled-outcome study. Psychosomatic Medicine, 35, 484-496. ↑ Sargent J. D.; Green E. E.; Walters E. D. (1972). "The use of autogenic feedback training in a pilot study of migraine and tension headaches". Headache. 12 (3): 120–124. doi:10.1111/j.1526-4610.1972.hed1203120.x. PMID 5075461. ↑ Sargent J. D.; Walters E. D.; Green E. E. (1972). "Psychosomatic self-regulation of migraine headaches". Seminars in Psychiatry. 5: 415–427. ↑ Evans, RW (January 2013). "A rational approach to the management of chronic migraine". Headache. 53 (1): 168–76. doi:10.1111/head.12014. PMID 23293866. ↑ Flor H (2002). "Phantom-limb pain: characteristics, causes, and treatment". The Lancet, Neurology. 1 (3): 182–189. doi:10.1016/S1474-4422(02)00074-1. ↑ Djajadiningrat, T., Geurts, L., Munniksma, P.R., Christiaansen, G., & de Bont, J. (2009). Rationalizer: An emotion mirror for online traders. Proceedings of the 5th International Workshop on Design and Semantics of Form and Movement, Taipei, Taiwan, 39-48. ↑ Astor PJ, Adam MT, Jerčić P, Schaaff K, Weinhardt C (2013). "Integrating biosignals into information systems: A NeuroIS tool for improving emotion regulation". Journal of Management Information Systems. 30 (3): 247–277. doi:10.2753/MIS0742-1222300309. ↑ Sutarto, AP; Wahab, MN; Zin NM (2012). "Resonant breathing biofeedback training for stress reduction among manufacturing operators". Int J Occup Saf Ergon. 18 (4): 549–61. PMID 23294659. ↑ Pacella, E; Pacella, F; Mazzeo, F; Turchetti, P; et al. (November 2012). "Effectiveness of vision rehabilitation treatment through MP-1 microperimeter in patients with visual loss due to macular disease". Clin Ter. 163 (6): 163(6):e423–8. PMID 23306757. ↑ Geyman, J. P., Deyon, R. A., & Ramsey, S. D. (Eds). (2000). Evidence-based clinical practice: Concepts and approach. Boston: Butterworth-Heinemann. ↑ Sackett, D. L., Straus, S. E., Richardson, W. S., Rosenberg, W., & Haynes, R. B. (Eds.). Evidence-based medicine: How to practice and teach EBM. Edinburgh, New York: Churchill Livingstone. ↑ Moss D.; LaVaque T. J.; Hammond D. C. (2004). "Introduction to White Papers Series series—Guest editorial". Applied Psychophysiology and Biofeedback. 29 (3): 151–152. doi:10.1023/B:APBI.0000039305.13608.37. 1 2 LaVaque T. J.; Hammond D. C.; Trudeau D.; Monastra V.; Perry J.; Lehrer P.; Matheson D.; Sherman R. (2002). "Template for developing guidelines for the evaluation of the clinical efficacy of psychophysiological evaluations". Applied Psychophysiology and Biofeedback. 27 (4): 273–281. doi:10.1023/A:1021061318355. PMC 2779403 . PMID 12557455. ↑ Moss D.; LaVaque T. J.; Hammond D. C. (2004). "Introduction to White Papers Series series -- Guest editorial". Applied Psychophysiology and Biofeedback. 29 (3): 151–152. doi:10.1023/B:APBI.0000039305.13608.37. ↑ Palsson O. S.; Heymen S.; Whitehead W. E. (2004). "Biofeedback treatment for functional anorectal disorders: A comprehensive efficacy review". Applied Psychophysiology and Biofeedback. 29 (3): 153–174. doi:10.1023/B:APBI.0000039055.18609.64. PMID 15497616. ↑ Monastra V.; Lynn S.; Linden M.; Lubar J. F.; Gruzelier J.; LaVaque T. J. (2005). "Electroencephalographic biofeedback in the treatment of Attention-Deficit/Hyperactivity Disorder". Applied Psychophysiology and Biofeedback. 30 (2): 95–114. doi:10.1007/s10484-005-4305-x. PMID 16013783. ↑ Crider A.; Glaros A. G.; Gevirtz R. N. (2005). "Efficacy of biofeedback-based treatments for temporomandibular disorders". Applied Psychophysiology and Biofeedback. 30 (4): 333–345. doi:10.1007/s10484-005-8420-5. PMID 16385422. ↑ Linden W.; Moseley J. V. (2006). "The efficacy of behavioral treatments for hypertension". Applied Psychophysiology and Biofeedback. 31 (1): 51–63. doi:10.1007/s10484-006-9004-8. PMID 16565886. ↑ Glazer H. I.; Laine C. D. (2006). "Pelvic floor muscle biofeedback in the treatment of urinary incontinence: A literature review". Applied Psychophysiology and Biofeedback. 31 (3): 187–201. doi:10.1007/s10484-006-9010-x. PMID 16983505. ↑ Karavidas M. K.; Tsai P.; Yucha C.; McGrady A.; Lehrer P. M. (2006). "Thermal biofeedback for primary Raynaud's phenomenon: A review of the literature". Applied Psychophysiology and Biofeedback. 31 (3): 203–216. doi:10.1007/s10484-006-9018-2. PMID 17016765. ↑ Sokkhadze E. M.; Cannon R. L.; Trudeau D. (2008). "EEG Biofeedback as a treatment for substance use disorders: Review, rating of efficacy and recommendations for further research". Applied Psychophysiology and Biofeedback. 33 (1): 1–28. doi:10.1007/s10484-007-9047-5. PMC 2259255 . PMID 18214670. ↑ Nestoriuc Y.; Martin A.; Rief W.; Andrasik F. (2008). "Biofeedback treatment for headache disorders: A comprehensive efficacy review". Applied Psychophysiology and Biofeedback. 33 (3): 125–40. doi:10.1007/s10484-008-9060-3. PMID 18726688. ↑ Yucha, C., & Gilbert, C. (2004). Evidence-based practice in biofeedback and neurofeedback. Wheat Ridge, CO: Association for Applied Psychophysiology and Biofeedback. ↑ Moss, D., & Andrasik, F. (2008). Foreword: Evidence-based practice in biofeedback and neurofeedback. In Yucha, C., & Montgomery, D. (2008). Evidence-based practice in biofeedback and neurofeedback (2nd ed.). Wheat Ridge, CO: Association for Applied Psychophysiology and Biofeedback. ↑ Neblett R.; Shaffer F.; Crawford J. (2008). "What is the value of Biofeedback Certification Institute of America certification?". Biofeedback. 36 (3): 92–94. ↑ Washington State Legislature WAC 296-21-280 Biofeedback Rules. ↑ Gevirtz, R. (2003). The behavioral health provider in mind-body medicine. In D. Moss, A. McGrady, T. C. Davies, & I. Wickramasekera (Eds.). Handbook of mind-body medicine for primary care. Thousand Oaks, CA: Sage Publications, Inc.
↑ De Bease C (2007). "Biofeedback Certification Institute of America certification: Building skills without walls". Biofeedback. 35 (2): 48–49. 1 2 Shaffer, F., & Schwartz, M. S. (in press). Entering the field and assuring competence. In M. S. Schwartz, & F. Andrasik (Eds.). Biofeedback: A practitioner's guide (4th ed.). New York: The Guilford Press. ↑ Dickinson T (2006). "BCIA certification for the biofeedback treatment of pelvic floor disorders". Biofeedback. 34 (1): 7. ↑ Mandler, George; J.M. Mandler; E. T. Uviller (1958). "Autonomic feedback: The perception of autonomic activity". Journal of Abnormal and Social Psychology. 56 (3): 367–373. doi:10.1037/h0048083. ↑ Bernard C (1957) [First published 1865]. An Introduction to the study of experimental medicine. Mineola, N.Y: Dover. ISBN 0-486-20400-6. ↑ Tarchanoff, JR (1885). "[Voluntary acceleration of the heart beat in man]". Pfluger's Archive der gesamten Physiologie. 35: 109–135. doi:10.1007/BF01612726. ↑ Bair, JH (1901). "Development of voluntary control". Psychological Review. 8 (5): 474–510. doi:10.1037/h0074157. ↑ Bruce, Robert C. (1990). Bell: Alexander Graham Bell and the conquest of solitude. Ithaca, N.Y: Cornell University Press. ISBN 0-8014-9691-8. ↑ Wiener, Norbert (2007). Cybernetics Or Control And Communication In The Animal And The Machine. Kessinger Publishing, LLC. ISBN 1-4325-9444-3. ↑ Moss D (1999). "Biofeedback, mind-body medicine, and the higher limits of human nature". Humanistic and transpersonal psychology: a historical and biographical sourcebook. Westport, Conn: Greenwood Press. ISBN 0-313-29158-6. ↑ Lisina MI (1965). "The role of orientation in the transformation of involuntary reactions into voluntary ones". In Voronin IG; Leontiev AN; Luria AR; Sokolov EN; Vinogradova OB. Orienting reflex and exploratory behavior. Washington, DC: American Institute of Biological Studies. pp. 339–44. ↑ Kimmel HD (May 1974). "Instrumental conditioning of autonomically mediated responses in human beings". Am Psychol. 29 (5): 325–35. doi:10.1037/h0037621. PMID 4847492. ↑ Mandler, G, Mandler, JM, and Uviller, ET. Autonomic feedback: The perception of autonomic activity. Journal of Abnormal and Social Psychology. 1958; 56, pp. 367-373. ↑ Basmajian, J. V. (Ed.). (1979). Biofeedback: Principles and practice for clinicians. Baltimore: Williams & Wilkins. ↑ "under changes". Kontinuita.com. Retrieved 2012-01-09. ↑ "Scope New York Home". Scope-art.com. Retrieved 2012-01-09.